I’ve worked with Cranks a couple of times in the past, so you’re probably familiar with them by now. If not, all you need to know is that they have a very well-regarded vegetarian restaurant in Devon, they produce yummy bread, and they have a really fab range of vegetarian sandwiches, wraps etc. Basically, they’re a vegetarian’s dream. Unfortunately, Devon is a long way from where I live (I mean, those of you in the US or Australia would probably consider 225 miles to be just round the corner, but it’s a long way in UK terms! ), so I’ve not yet made it down to the restaurant. If I’m ever in that part of the country, you can bet that Cranks will be first on my list, but for now, I have to settle for just ogling the menu online (does anyone else enjoy browsing a menu almost as much as eating the actual food?). Cranks have recently launched their new winter menu, and one of the dishes featured is a seasonal tart. As soon as I read these words, I was inspired – it conjures up any numbers of delicious images. The sort of dish that could change day by day depending on what looks good at the market. I decided to make a cauliflower cheese tart for my version. Cauliflower is pretty much available year-round, but it always reminds me of roast dinners, creamy soups, and other warming wintery dishes. And, of course, the ultimate cauliflower dish: cauliflower cheese. 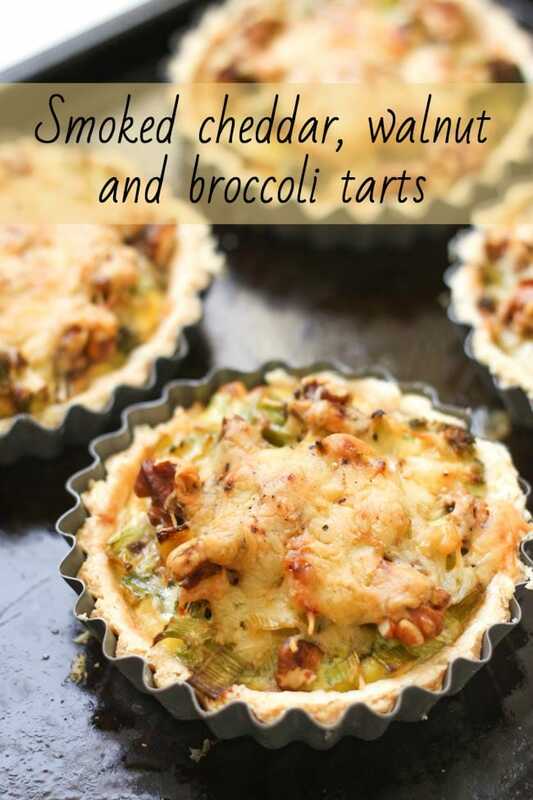 Once you’ve added the steamed cauliflower to the tart, it’s just a case of pouring over the creamy, cheesy filling. It’s basically a simple white sauce, flavoured with two types of cheese (I used gruyere and cheddar, but you could mix it up with other cheeses if you prefer), and set with a few eggs. It’s seriously delish. 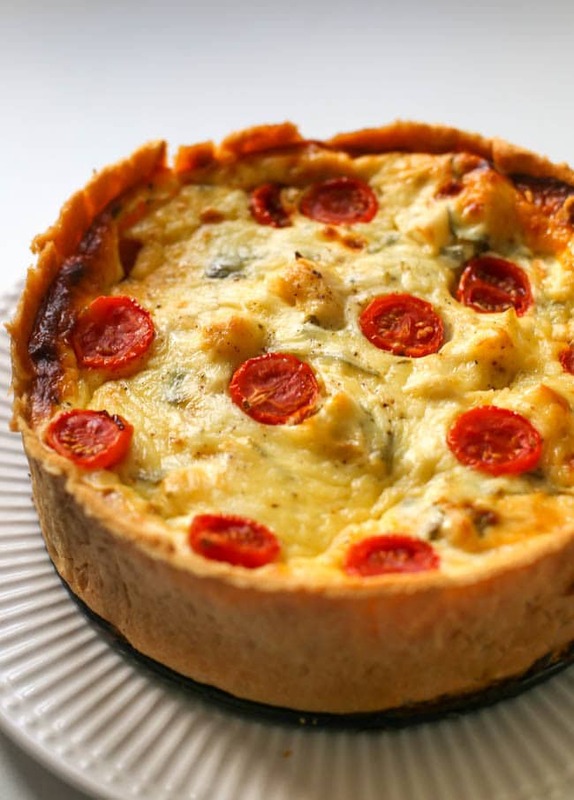 A nice big tart like this is a great option for a dinner party – the sort of thing that will evoke ‘wow’s as it’s presented. 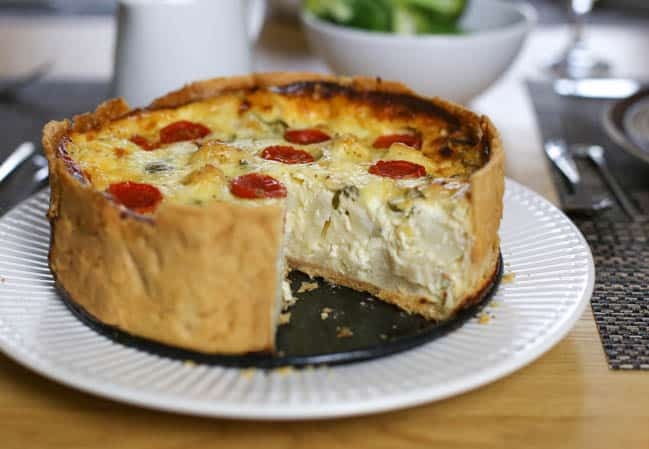 You’ll definitely want to share it around, otherwise you may find yourself going back for ‘just one more’ small slice (which actually turns into half the tart when you do it six times). Since baked potatoes also feature on the Cranks menu, I served my tart alongside some hot jackets (started in the microwave to save time, and finished off in the oven to get nice and crispy), some steamed veggies, and a drizzle of gravy. It was a really perfect supper. Are any of you in Devon? If so, pop down to Totnes to try the new Cranks menu, and report back to let me know how it tastes! Cut the cauliflower into florets, and steam for around 10-15 minutes, or until fairly soft. Meanwhile, lightly grease an 8 inch springform cake tin. Dust the pastry and surface with flour, and roll it out until it measures around 12 x 12 inches. Lay it over the cake tin, and gently ease it into the corners, pressing gently. If you end up with any tears, just press the pastry back together. Trim off any extreme excess, but leave an inch or two extra around the edge to allow it to shrink a little during baking. Prick the pastry a few times with a fork, then place in the oven to blind bake for around 20 minutes, until golden brown. If the pastry has puffed up at all, just press it back down gently. Trim off any excess pastry, and reduce the heat of the oven to 170°C (Gas Mark 3 / 325°F). Melt the butter in a saucepan, and add the flour. Cook over a fairly low heat for a minute or so, stirring regularly, to cook the flour. Add the milk a little at a time, stirring until smooth each time and allowing the sauce to thicken up before adding more (it should take a few minutes in total to add all of the milk). 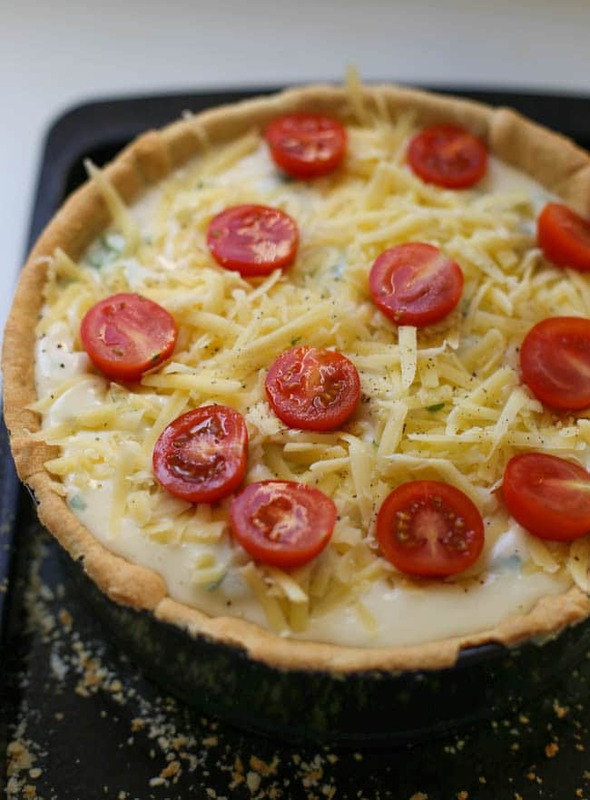 Remove from the heat, add the cheeses (holding back a little for sprinkling on top of the tart), and season generously. Mix well, and leave to cool for 5 minutes. Add the cream to the cheese sauce, and mix well again. In a large jug, lightly beat the eggs. Add about a tablespoon of the cheese sauce to the eggs, and mix thoroughly with a fork to temper the eggs. Repeat a couple more times, then add the remaining sauce and the fresh parsley, and mix thoroughly. Add the steamed cauliflower to the pastry, and pour over the sauce. 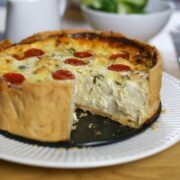 Sprinkle the remaining cheese on top, add the halved cherry tomatoes cut-side up, and finish with some more black pepper. Bake for around 1 hour, or until the egg mixture is set all the way through. 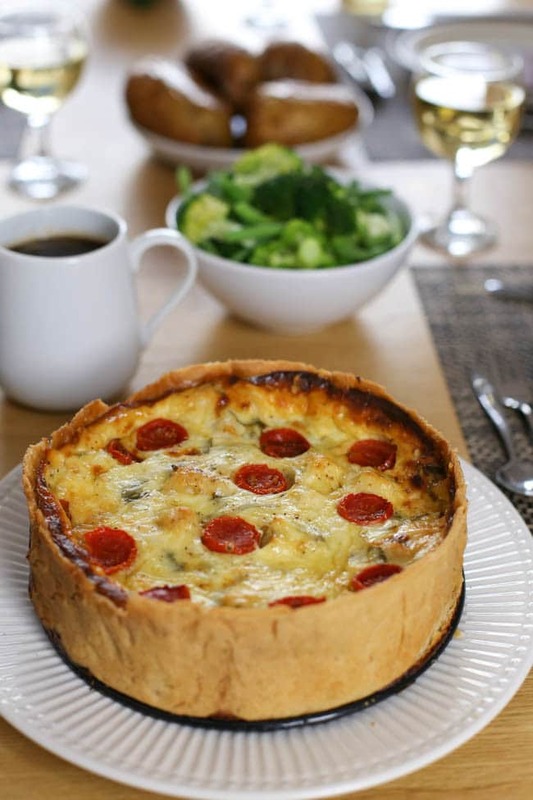 If the cheese or pastry is browning too quickly, cover the tart loosely with foil and return it to the oven. Allow to cool for at least 10 minutes before cutting (it's great served cold too). Ok, this looked so good, but I totally needed to get rig of some leftovers, so I unveganed it. I had some bacon grease and a pan with drippings (drained all but a few tablespoons), so I used that with the flour. To the crust I added my leftover broccoli, a few bits of sweet potatoes and some left over roasted chicken, chopped. 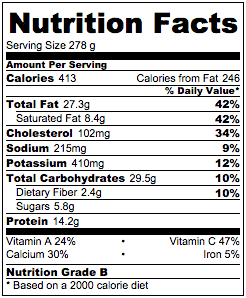 Also added some onion powder. It was a great medium for repurposing some leftovers. I used a 10 inch pan and made the crust bigger. It was a pretty and awesome Sunday dinner. 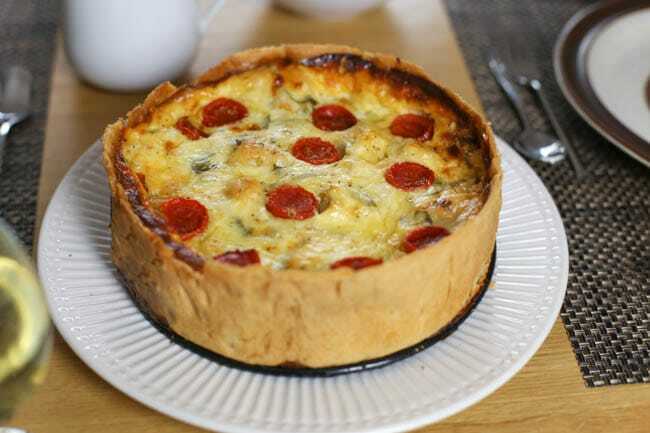 It’s like a big quiche! Now I need to try it again the way it was written so I can taste what it is really supposed to taste like! Oh, I also didn’t notice the change in oven temperature and baked it at 375 degrees. It came out fine and the crust was not burnt either. Maybe my oven is off. This is a wonderful recipe. I have made it many times with no problem but this time I realized I wasn’t sure of the temperature to cook the tart. The recipe calls for the pastry to be baked at 375 and then turned down to 325. That is fine but should the tart be cooked at 325 or 375? I should not have paid attention to this as I was doing fine at 350 although it took quite a while. Thanks for sharing as I often thought I am a weird lady who baked Leek and Bacon Quiche this size as I saw all are like Pie ! I am a Malaysian Chinese and saw a German lady taught Leek and Bacon Quiche in TV and since I often bake it as it is so yummy. Haha I do love a nice deep pie :D Enjoy! 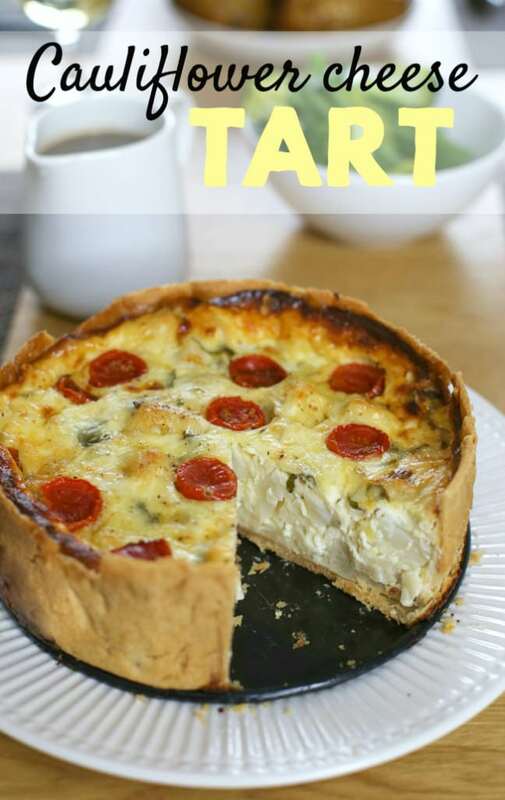 The cheesy tart looks awesome and inviting. Cauliflower goes well with while sauce and cheese. How very innovative, I am not a huge fan of cauliflower but your tart looks tempting. To be honest the cauliflower mostly just serves to bulk out the cheesy sauce :D I’m sure you’d love this even if you’re not a cauliflower lover! Oh wow! That sounds and looks amazing! I might have to give that one a go – even with my own awful cooking skills! I’ve never been to the restaurant, it’s definitely on the bucket list though! The bap sounds interesting! What a fab idea! It’s like a side dish in a tart. I wonder what other varieties you could come up with using this concept? Oooh I don’t know but now you’ve got me thinking! Your description was spot on. It must smell like heaven too. I trust that went down well. Cauliflower cheese topped with mashed potato?! That sounds like my idea of heaven! Oh drat, and I’m in the middle of cooking for Thanksgiving. This would have been a perfect addition! Luckily many more holidays on the way!